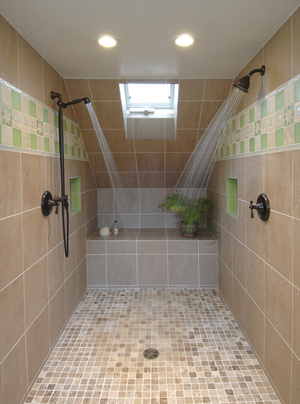 The luxurious spa-like shower is our clients' favorite feature, and apparently caught the judges' eye as well. The Building Industry Association of Washington recognized a bathroom addition of Jackson Remodeling as the best in the state during their REX award banquet in June. In the category "Best bathroom over $75,000", Jackson was compared to other projects by top remodelers around the state. The BIAW REX awards are the state's highest honors for remodeling projects. In accepting the award, co-owner Erik Jackson thanked Richard Williams, who was the project manager and lead carpenter, as well as the homeowners.